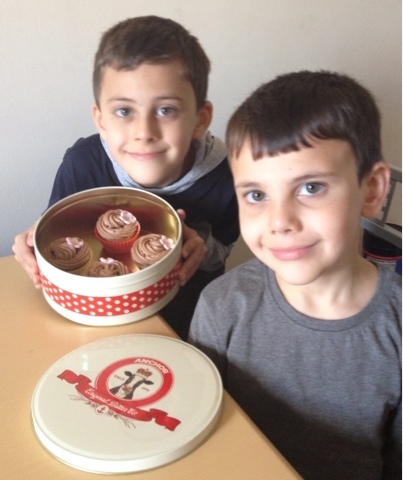 Thanks to BritMums and Anchor I'm excited to share this sponsored post with you and tell you about anchor's new reward club........and share a wonderful recipe with you. 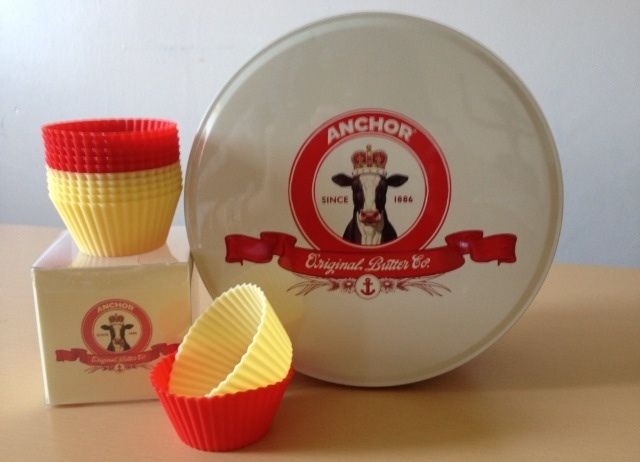 Anchor have just launched a brand new loyalty scheme – The Anchor Rewards Club – where you can collect points to exchange for must-have kitchenware items (cake tins, silicone cases,butter dishes, tea towels) and dining out discount vouchers. 1 Preheat the oven to 180C, gas mark 4; line a 12-hole muffin tin with cases. In a large bowl, beat together the butter and sugar with electric beaters for 3-4 minutes until light and fluffy. Beat in the eggs one at a time, then beat in 1 tbsp flour. Now tip half the mixture into a separate bowl. 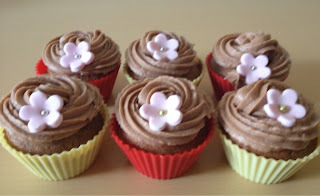 2 For the vanilla cupcakes, beat the vanilla extract and 2 tbsp milk into one half of the batter. Then fold through 90g flour and ½(half) tsp baking powder. Divide the mixture between 6 of the muffin cases. 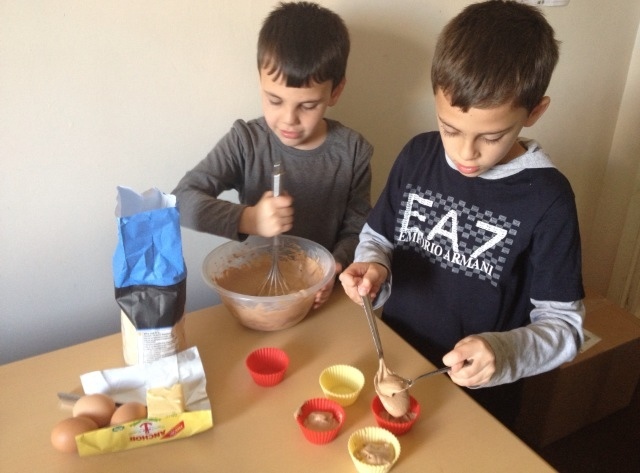 3 For the chocolate cupcakes beat the milk into the second bowl of batter. Then fold through the cocoa and the remaining 90g flour and ½(half) tsp baking powder. Divide the mixture between the remaining 6 muffin cases. 4 Bake all the cupcakes for 20 minutes, then cool in the tin for 5 minutes before transferring to a wire rack to cool completely. 5 To make the buttercream, using electric beaters, beat together the butter and icing sugar for 3-4 minutes until light and fluffy. Beat in the lemon juice and vanilla extract. Warm the milk in the microwave and pour into the bowl; beat until you have a smooth, creamy icing. 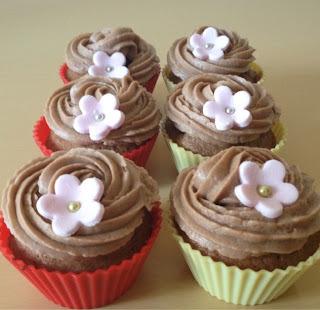 You can also add food colouring to half the icing. 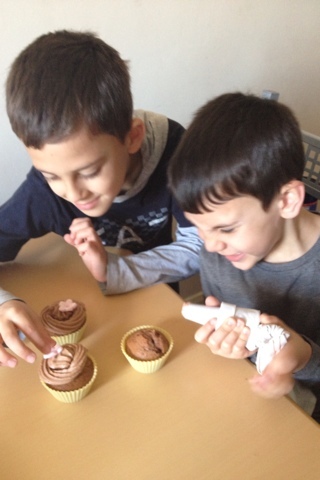 6 Pipe or swirl the buttercream onto the cooled cupcakes, then decorate as desired. Chocolate cupcakes fit for a queen. Serves:12 Cooking time:20 minutes Preparing time:30 minutes. This recipe is from Anchor Dairy Recipes I adjusted recipe by adding cocoa powder to buttercream. 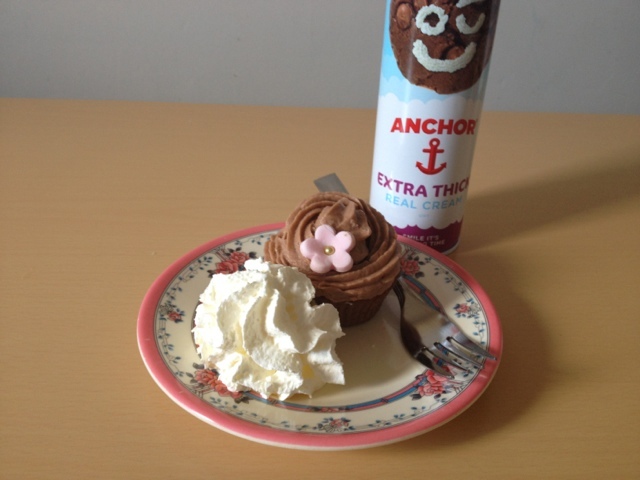 I'm working with Anchor to promote their brands and new Rewards Club, find out how you can get some of their Kitchenware as well as more prizes.https://rewardsclub.anchordairy.co.uk. Mmmmmm, yum, you just gave me a great idea for today! 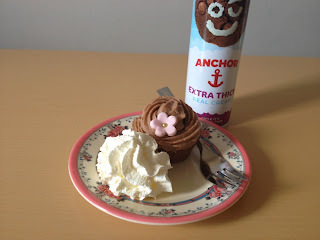 Oh My God, chocolate cupcakes with squirty cream - pass some over I am totally with you on that choice! Delicious and what helpful chefs you have! The boys were a great help and enjoy baking as much as me. I'm defiantly a squirts cream gal.....love it with a slice of cake or strawberries.